Yes, dreams do come true. That is, if you’ve ever wanted a one-way ticket to the Red Planet only to never return again to life on Earth- your wish may just come true but for a very hefty price (your life). Certainly a few questions popped into mind when we heard this mission discussed in the media, the most popular being “WHY!? Why on EARTH would anyone want to partake in, what some are calling, a suicide mission?” Seriously, how much do you hate living life that you would rather pay a ton of money in order to get off Earth only to whittle away on Mars? I also wonder how the families of the people wanting a spot on this mission feel about this? The endearing term of affection such as “I love you and I cannot live without you”, I guess, does not apply here because evidently they can live without them; in fact, they are departing this Earth by choice, so more like “I love you but I’d rather not return”. 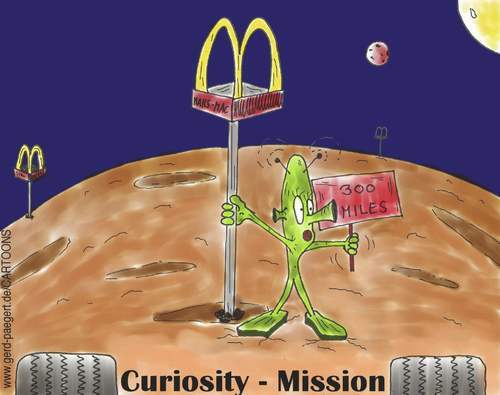 Do people realize there are no malls, no tv, no other lifeform, no McDonalds or real food on Mars? And even if you make it to Mars and last a day or two, so what? Who are you going to share this experience with? This mission is apparently taking place roughly 10 years from now which should, I would think, give experts enough time to think of some way to bring people back on a return trip, no? It would be a bit more comforting to those people eager to leave and their families that this is not necessarily going to be a permanent “vacation”, yet this isn’t something that is priority for the mission team. Also, couldn’t we simply take these people who are vying for a spot on this trip to a secluded desert somewhere and only feed them powdered beef, dried milk and give them limited supply of water with nothing to do and see how they like it first before just whisking them away to, literally, no man’s land?? Just.. baffling to me. Seriously, How Much Meaning Can You Give a Sweatshirt? For decades, baby dolls have been famous for their vagueness. Are they girl babies? Are they boy babies? Really, without their pink or blue outfits, who could say?